The F16 stands out in any crowd. 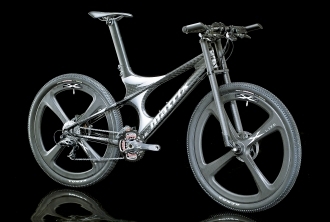 But its futuristic monocoque design and classic matt finish are not its only innovative attributes. Matrix have used advanced manufacturing techniques to create a high level of inbuilt compliance through the rear stays. With its aggressive angles this bike offers the performance of an out and out race machine combined with a forgiving chassis. The F16 is built for speed and accuracy whilst giving the rider the confidence from carbon usually only provided by much heavier alloy frames. It truly bridges the gap between racing and trail riding without compromising speed or comfort.